Away from home or the office? Now you can use a free app, Chrome Remote Desktop, to have complete control over your desktop computer back at the ranch! The first step is to open your desktop’s Chrome browser and visit the Chrome Webstore. 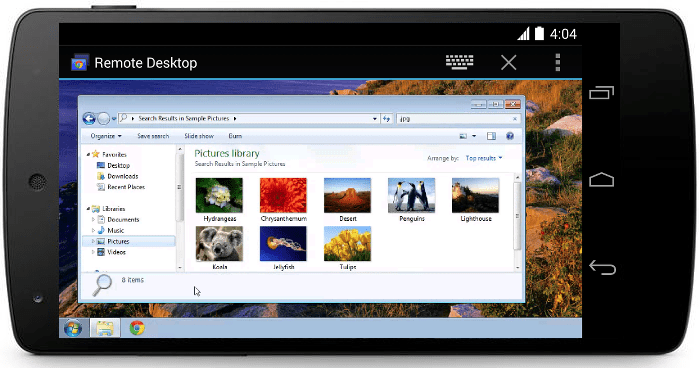 Find and install Chrome Remote Desktop. Open the app, choose your connected device, and enter the PIN provided. Now you’re connected and have full remote control over your desktop or laptop computer! Of course this all assumes your desktop computer is turned on while you’re away. On your mobile device, use your finger to ‘mouse around’ and simply tap to click. To initiate a right-click mouse action, use two fingers to tap the screen. Near the top of your device’s screen, click the keyboard icon to access keyboard input when necessary.